NETWORK UPDATE: The US OPEN adjusted up by 0.2 to 1.9 in final numbers. In addition, the rerun AMERICA’S FUNNIEST HOME VIDEOS received a 0.1 bump. CABLE HIGHLIGHTS: HBO’s TRUE DETECTIVE grew impressively during the course of its first season, and it picked up almost where it had left off, with a 1.42 rating compared to 1.53 for the 2014 finale. (The January 2014 series premiere was at 0.97.) The Dwayne Johnson vehicle BALLERS was also strong, debuting at 1.10, while THE BRINK was solid but somewhat lower at 0.66. HBO’s night ended with LAST WEEK TONIGHT down 0.04 to 0.55. On TNT, THE LAST SHIP returned with a 2-hour premiere at 0.69, a big step down from the 1.18 for its series premiere last June, and also the 1.01 for the season finale. On Showtime, PENNY DREADFUL gained 0.03 to 0.22, NURSE JACKIE lost 0.03 to 0.17, and HAPPYISH (not on the chart) held at 0.07 in 18-49s, but lost 27K total viewers to 197K. AMC’s HALT AND CATCH FIRE, which aired a terrific episode this week, didn’t benefit from it, holding at 0.15. SALEM (WGNAmerica) rose 0.04 to 0.11. On the unscripted side, NAKED AND AFRAID gained back some of last week’s loss, up 0.16 to 0.60. FOOD NETWORK STAR dropped 0.07 to 0.59, and lead-out CUTTHROAT KITCHEN lost a tenth to 0.42. BAR RESCUE (Spike) was at 0.43. On E!, BOTCHED stumbled by 0.24 to 0.43, and RICH KIDS OF BEVERLY HILLS fell 0.14 to 0.21. 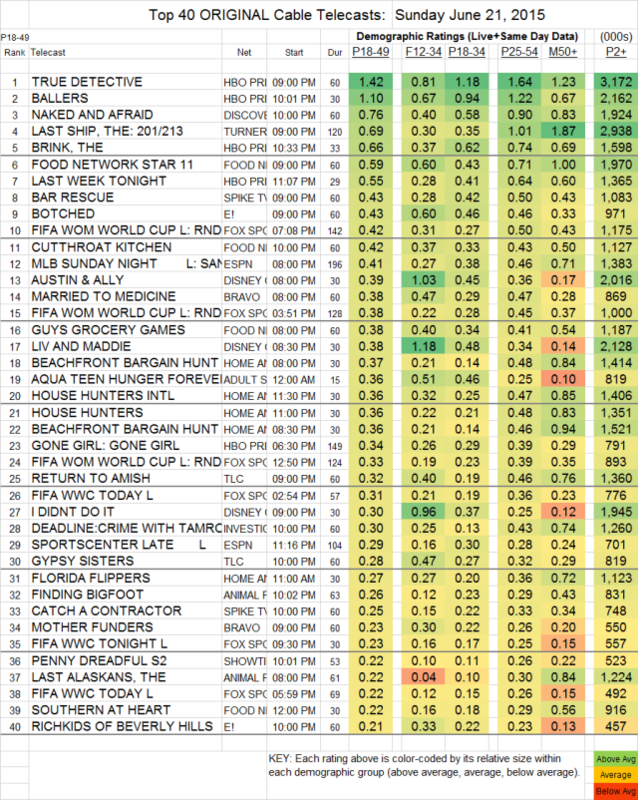 At Bravo, MARRIED TO MEDICINE was down 0.06 to 0.38, and lead-out MOTHER FUNDERS was at 0.23. The night’s highest rated sports telecast was a WOMENS WORLD CUP match on Fox Sports 1 at 0.42. Finally, in response to a reader request: MY MILLION DOLLAR INVENTION (Smithsonian) proved less valuable than that, at 0.01/48K.